Dodgers Bring Back Trayvon Robinson, And Remember When He Mattered? #Dodgers sign four to minor league deals: OF Trayvon Robinson (original L.A. draft pick), 2B Ryan Adams, C Miguel Olivo and RHP Mark Pope. We already knew about Olivo, and you don’t care about Adams (didn’t play last season, has a drug suspension on his sheet, made a cameo in the bigs for the 2011 Orioles) or Pope (five innings above Single-A). But Robinson? Well, that’s a name you know, and a name you once cared about, intensely. So did I, but this isn’t about what Robinson’s future is. Truth is, he probably doesn’t have one. He didn’t appear in the bigs last year, and when he had previously, he put up a disappointing .215/.272/.330 line in parts of two seasons for Seattle. In 2013, he was so bad for Baltimore’s Triple-A team (.220/.307/.333) that they bounced him back to Double-A in June. It’s not exactly how he expected his age-25 season to go, I imagine, and that means for 2014, he’s probably not even guaranteed to make any Dodger minor-league team. If he does, and lands in Albuquerque alongside Joc Pederson, he’ll be a pretty stark example of a cautionary tale. I hardly need to remind you much we all howled in 2011 when the Dodgers made a deadline-day deal to send him to Seattle as part of of the Mariners trading Erik Bedard to Boston. 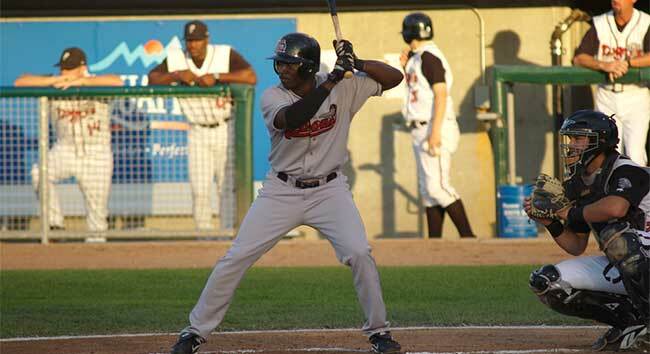 You can find the links on our various previous sites, no doubt; Robinson was coming off excellent 2009-10 seasons that put him on the prospect map, and was hitting .293/.375/.563 with 26 homers in 100 games for Albuquerque at the time, sharing an outfield with Jerry Sands and his .278/.344/.586 line. In return for a Los Angeles native who seemed to be maybe weeks away from suiting up for his hometown team, the Dodgers got Tim Federowicz, Stephen Fife, and Juan Rodriguez. None were considered top prospects. Most of us — myself included — had never heard of any of them, and so the outrage was predictable, unified, and continuous. Jack: … he ummm … well gee, Ned, don’t you want a minor league catcher who can’t hit and some random relief prospects instead? Ned: … sorry, I was watching a fly. Isn’t it funny they’re named “fly” and they fly around? right you guys?? Rodriguez never amounted to anything, but Fife has made 15 starts with a 3.49 ERA for a team that has desperately needed the depth. He’s still a useful guy to have around. Federowicz still isn’t much of a hitter, but is a well-regarded defensive backstop who should serve as a cheap backup for years. Neither are stars or anywhere close to it, but both are major leaguers with some value. Now Robinson’s back, and we might even see him in a Dodger uniform in spring training. We might see him put up big Albuquerque numbers again. And if we’re lucky, we’ll see him and Pederson share the same Triple-A outfield, and he’ll remind us that as much as we all love Joc right now, nothing is ever guaranteed. Previous Is There Any Hope For Chris Perez Or Brandon League?